Hello and welcome to my site! Hello, my name is James Luxford and I am a film journalist from London. This website is where you can access all my film reviews, interviews, radio appearances and anything else! Please feel free to look around, my latest articles are on the left, with older ones accessible by looking through the archives below. Please click the image above to read this week’s “At The Movies” column as it appears in Oxford Journal, Oxfordshire Guardian and Basingstoke Observer. 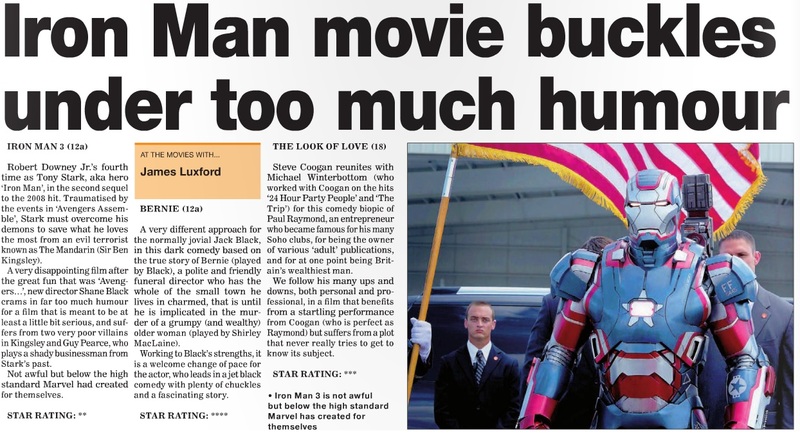 Reviews of “Iron Man 3”, “Bernie” and “The Look of Love”. An article for The National, the UAE’s largest English language newspaper, on how parenthood is portrayed in the movies. The article appeared in the “Arts & Life” section of the paper on 16th April and can be viewed online by clicking the image above.